The anti-racist ‘NEVER AGAIN’ Association joined forces with the African organization Fatima and the Eco-Tiras NGO for joint educational events taking place on the bank of the beautiful river Dniester in Moldova, on 12 July 2013. 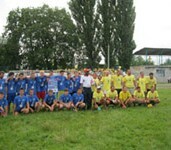 A multi-ethnic football game against racism was organized in the stadium of Energetik in Dubossary, a town on the territory of the unrecognized Republic of Transnistria, the site of a frozen military conflict which started in the early 1990s. Players and numerous enthusiastic supporters came from various ethnic groups living on both banks of the river Dniester, and the match symbolically brought together the divided community. Dr Keita Abdramane, the founder of Fatima who comes from Mali and lives in Moldova, was the referee. The game was preceded by a discussion about issues of racism, stereotypes and xenophobia with young people who received information about the ‘NEVER AGAIN’ Association, Fatima, and the FARE Network, including the ‘RESPECT Diversity – Football Unites’ activities during Euro 2012. The discussion featured Dr Keita Abdramane and Dr Rafal Pankowski and it was moderated by Natalia Sineaeva-Pankowska. The session took place at the ‘Nistru’ youth centre in frames of the Summer School ‘Dniester 2013’ organied by Eco-Tiras International Environmental Association of Dniester River Keepers, which was supported, among others, by the Organization for Security and Cooperation in Europe (OSCE), the Finnish Embassy and the National Endowment for Democracy (USA). The ‘NEVER AGAIN’ Association is an educational and monitoring organization established in Poland in 1996. It is a regional East European partner of the FARE Network. In 2009, in cooperation with UEFA and the FARE network ‘NEVER AGAIN’ set up the East Europe Monitoring Centre documenting racism and xenophobia across the region.